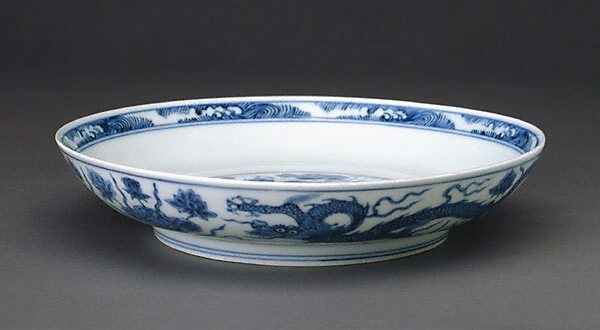 Three five-clawed dragons, one in the centre of the interior and two on the exterior surface decorate this elegant plate. With their mouths closed, the elongated dragons swim amongst the water lotus and lake plants. The lotus is a symbol of purity and perfection both in traditional Chinese literati culture and Buddhist art. The serene dragons, the lotus and the band of calm water lapping the interior rim together present a fresh and placid scene quite distinct from dragons contesting for pearls amid the clouds.